(Newser) – Eman Ahmed Abd El Aty's family says the 36-year-old Egyptian woman hasn't left her home in 25 years, the BBC reports. Her extreme weight forced her to crawl instead of walk by age 11, and an ensuing stroke left her bedridden. Her family says she weighs more than 1,100 pounds, which would make her the heaviest woman alive—the current Guinness record-holder is only 643 pounds—and close to the heaviest woman ever, according to the Washington Post. 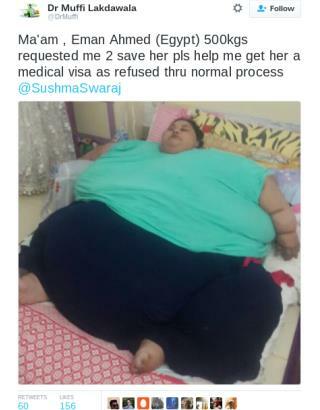 While Abd El Aty's weight hasn't been confirmed, Dr. Muffazal Lakdawala in India estimates she is at least 990 pounds based on photos of her. "My initial reaction was '‘How is she even alive?'" he says. His next reaction was to try to save her. Often I want to ask "normal" overweights how in hell they let this happen. To me, it's inconceivable. No weight loss operations done in Egypt?